Dr. Bill Mueller and Dr. Jose Santos were guests on “Catholicism Live!” today. They are members of the Catholic Medical Association and are reviving the Catholic Physicians Guild in San Antonio. What is the Catholic Medical Association (CMA)? Catholic Medical Association – an organization formed to uphold the principles of the Catholic faith in the science and practice of medicine. Anyone with an interest in being a part of an organization that strives to practice the vocation of medicine in the image of Christ, the divine physician. Physicians, dentists, nurses, allied health professionals, clergy, religious, anyone interested in integrating Catholic principles into health care. What is the history of the Catholic Medical Association? Local guilds began in 1912 as a way to educate physicians in Church doctrine related to the practice of medicine. National organization formed in 1932 formalized relationship between local guilds. By the mid-1960’s, CMA was the 6th largest medical association in the US with over 100 guilds and 10,000 physician members. In 1968, the organization fractured after disagreement over Humane Vitae and the use of contraception. In 1997, the organization was renamed, affirmed its support of the magisterial teachings of the Church, and definitive steps were taken to support physicians through local guilds. The organization’s goal is to form guilds in every state, diocese, and parish in North America to serve, form, and teach Catholic physicians. Dr. Santos and Dr. Mueller are working to establish a San Antonio Physician’s Guild of the CMA. Support, educate, and encourage those interested in promoting the authentic practice of Catholic medicine. Work with the Archdiocese to pursue authentic Catholic medical care in the San Antonio area. For example, working with Converging Roads program to provide local expertise and resources in diocesan effort to promote Catholic medical ethics. National Organization: Annual meeting in Springfield, Illinois in October. The Catholic Medical Association supports meaningful health-care reform that is based on sound ethics and economics. The conscience rights of health-care providers are not adequately addressed in any current legislation. Democrats on the Senate Health, Education, Labor, and Pension (H.E.L.P.) Committee voted against an amendment that would have prohibited forcing health-care providers to perform or participate in abortion. This issue is very timely, since the department of Health and Human Services canceled a Conscience Protection Rule earlier this year and has not announced what will replace it. In a July 2 interview, President Obama promised a ‘robust conscience clause.’ The CMA believes it is time to deliver the text of that conscience clause and make conscience protection an integral part of any health-care reform legislation. Potential for a mandate to finance and provide abortion. White House officials and the Senate H.E.L.P. Committee have refused to exclude abortion from health-care legislation. The House Tri-Committee bill never mentions the word “abortion, but most analysts think that, without explicit exclusion, abortion will be mandated by the Secretary of HHS and/or by the courts. While health-care financing and delivery systems in the United States suffers from significant flaws impacting cost and access, which have accumulated over the years, the entire system is not broken. Reform legislation should address specific issues; not on replacing or overhauling the entire health-care system at one time. While attention is rightly paid to the socio-economic aspects of the crisis in health care and delivery, it is essential to acknowledge and respect the fundamental ethical principles at stake. Above all, it is necessary at this time to ensure that any national health-care reform legislation provides respect for human life (e.g., by not funding or mandating abortion as a “health-care benefit”) and respect for the conscience rights of health-care professionals (e.g., providing nothing less than the current protections in federal and state law—and preferably more). Health-care reform legislation must respect the integrity of the physician-patient relationship. This means that people should be free to choose physicians and health insurance coverage which accord with their values and needs. This also means that physicians must not be prevented—by the force of government regulations—from respecting their patients’ privacy or from offering the attention and treatments patients require based on the physician’s professional judgment. Ancillary (but significant) Issues. Any health care reform legislation must be carefully monitored to ensure that interest groups do not take the opportunity afforded by comprehensive legislation to insert provisions that harm the dignity of individuals or the family or that inappropriately serve the agenda of a particular group or ideology. This last weekend was an extraordinary one; 550 women gathered for the Catholic Women’s Conference that offered nationally known speakers, a Eucharistic Healing service, Spiritual direction, Reconciliation, music, and resources! It is refreshing to gather with women who love God, love the Catholic Church and yearn for a deeper relationship with Christ. Each year, the Conference offers a Eucharistic Healing Service led by Deacon Tom Fox. I really believe Tom has an incredible gift in leading this liturgical service with the Blessed Sacrament. One woman wrote informing us that the her knee was healed and healed of all pain. This is one story of many I am sure. Seeds of hope were planted in those present as Deacon Tom led a prayer in healing the memory of woundedness, of painful relationships, illnesses, doubt, discouragement and there was a time of silence before the Eucharistic Lord. The scripture he read that evening was from the book of Luke 8:40-48; the story of the woman with a hemorrhage. It was in her desire to be healed that she reached out to touch the cloak of Jesus and she was healed. As Deacon Lara carried the Monstrance with the Blessed Sacrament throughout the Church, women looked to the Eucharistic Lord. There was a lot of peace and I do believe many inner healings! Archbishop Gomez spoke on the topic of “Strong Women and Holy Mothers: Lessons from Scripture and the Saints”. He invited us to read about the women in the Scriptures; and how they were instrumental in the salvific plan of God. Lives of modern day Saints were used as testimonies to encourage us to grow in holiness. The speakers spoke on living a life of virtues, on the vocation and dignity of woman, on conquering discouragement and attaining peace. The women attending the Conference commented on how much they enjoyed the Catholic Women’s Conference. Go to http://www.facebook.com/pilgrimcenter for photos and videos from the event. Now…getting ready for our presentation at the Catechetical Conference in the Diocese of Victoria on the Holy Land. The following is a short introduction on our presentation. The Holy Land is the land sanctified by the Lord. For Christians, it is a place of pilgrimage, of experiencing the land of the Bible. Our concern even though millions of pilgrims and tourists travel to the Holy Land each year; few have an experience that puts them in touch with the local people to discover their story. In 1948; Christians made up approximately 20% of the population, today only 1.5% of Christians live in the Holy Land. Why is this an issue of peace and justice? Greg & Julie Alexander from The Alexander House will be our guests on the Wednesday, September 16 edition of Catholicism Live at 8:00pm. The Alexander House is a ministry whose mission is to strengthen marriage and lower the divorce rate. 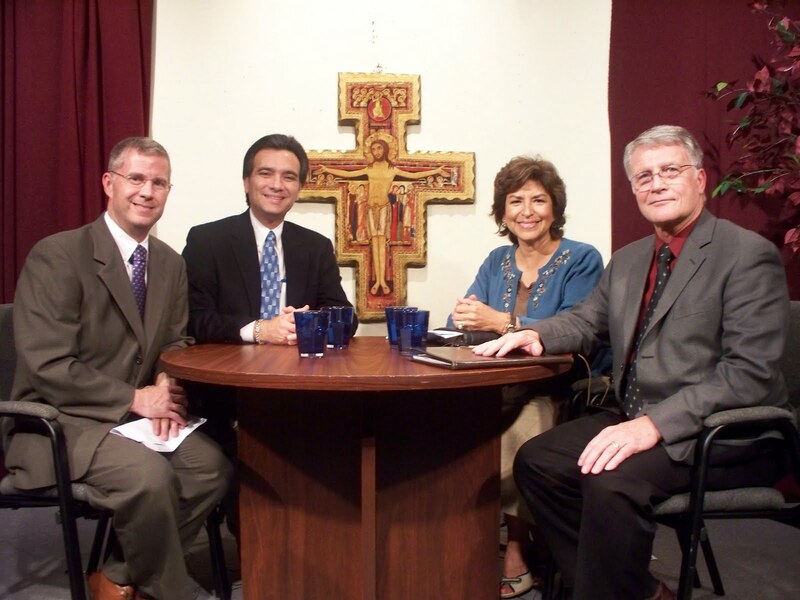 Greg and Julie also recently co-hosted a television series for EWTN with Fr. James Dean called Marriage Works in Christ: Broken and Blessed.